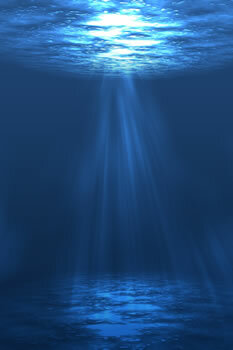 The human body is 65%-80% water and only oxygen is more vital to our existence than water. Just as our life depends on oxygen to provide energy for healthy functioning of the brain and all our vital organs, so too does our body rely on water for a healthy internal environment. 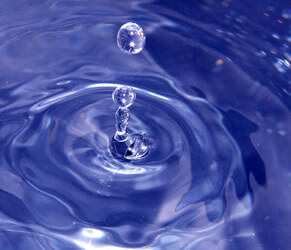 Water is the agent that ensures carriage of essential minerals and vitamins to all parts of the human organism. It is the fluid that can be found in every muscle, tissue, cell, vein and organ; without it the body could not perform its many and varied tasks. Dehydration is the state in which the body does not have enough water to maintain healthy functioning and is therefore an enemy to our physical well-being. Although most of us need not be concerned with dehydration in its most pronounced state, it is the equally hazardous state of partial dehydration that is doing so much damage. The body loses about 5 pints of water a day. Up to 3 pints are lost through urine and faeces and a further 2 pints are lost through breathing and perspiration. Therefore if our intake of water does not match what we lose (which in most cases it does not) a state of water imbalance is created, which is an ideal breeding ground for so many health problems. One of the tragedies of progress, modernisation and so called civilisation is that much of the ancient and valuable wisdom has been devalued and discarded, not because it is out-dated or is now redundant, but simply because we are so easily seduced by new horizons. Our intoxication for the new, which we nearly always seem to think is better, blinds us to that which was true and valid and continues to be true, even in the face of progress. Water is an excellent example of us neglecting and putting aside something valuable in the name of progress. The role and importance of water is only really cosmetically appreciated, its crucial role is only brought into view at times of shortage and drought, and even then its priceless function is not fully understood. Water really needs to be at the centre of our diets and lifestyle; however, the reality is that for many of us it is only on the periphery of our lives. What water most of us do consume is by default rather than by design. It slips into our diets via the other things we consume rather than being central to our consumption of solids and fluids. Our poor intake which comes largely from secondary sources means that most of us live in a partial or even semi- dehydrated state. This means the body can and does survive, because of its amazing capacity to do so, but we do pay a price for our inadequate intake of water. The price we pay is difficult to quantify, but there is substantial evidence that shows that the absence of an adequate volume of water in our lives (at least 3-4 pints a day) is one of the key contributors to ill health, disease, malfunctioning of vital organs and inefficiency generally in the body. To really grasp why water is so important to our health we need to first of all understand that the real secret to health is the removal of waste. If the waste products that contaminate the body are not removed then they become catalysts for ill health. It is the toxic compounds produced as a result of our breathing, digestive processes, cellular growth and decay, the activity of vital organs, circulation of blood, etc … that are primary hazards to our health. We increasingly have great concern for the external eco-system and rightly so because it is vital to our existence, but equally vital is our own internal ecology. Without sufficient water flowing through us we become safe havens for viruses, unhealthy bacteria and diseases of all kinds. This is not to say water is a miracle cure and that it alone can solve all our ills, because it cannot, but it is certainly the leading agent in creating physical well-being. Why? …. Because water is responsible for the production of so many vital fluids and other substances and is responsible for the transportation of key elements to where they are needed in the body. Water is also imperative for the removal of toxic waste generated by internal activity as well as the pollution that descends on us from elsewhere. Therefore without a continuous flow of water running through our bodies we become like stagnant ponds; foul smelling, dirty and struggling to sustain life. Stop the stagnation by trying to drink 3 or 4 pints of water from today and every day, and experience the wonder of water! Having hopefully established how vitally important water is to health, we believe it would further help the motivation of those considering to make the necessary adjustments to their water consumption to have more specific knowledge about water’s priceless role. The average person is 75% water and 25% solid mass but the brain tissue consists of around 85% water and so this is why a low intake of water can significantly affect the brain’s function, which in turn affects our thinking, concentration and perception etc. When there is dehydration in the body the brain secretes hystamine in order to try to restore balance and then stimulates the body’s water regulatory system which, with over-stimulation, due to on-going dehydration, can result in a number of different reactions in the body such as headaches, asthma, back pain, stomach ulcers, allergies, anginal pains, just to name a few. Water is an essential lubricant for the joints and particularly for the vertebral joints of the spine. Water is held in the disc core in the spine which supports the compression and the weight of the upper part of the body. It is estimated that three quarters of the weight of the upper body is supported by the water held in the disc core, which gives some indication of the essentiality of water. When we look at the digestion water is necessary for keeping the stomach acid in balance. When there is a lack of water then the digestive process is disoriented and the valves either side of the stomach become weakened or relax at the wrong times. This can allow stomach acid to pass into the wind-pipe, particularly when the person is lying down, producing that familiar pain commonly called heart-burn. Water is essential in helping the stomach produce a strong, thick mucus barrier which protects the stomach wall from being damaged by the acids needed to digest our food. Many of the stomach related phenomena such as colitis, IBS, Chrones Disease etc. are increasingly being documented as signs of dehydration. The main systems of the body, endocrine, lymphatic, central nervous system, digestive system and immune systems, all depend on water for successfully carrying out their functions. In fact, without water, none of these could work efficiently which would mean a total collapse in our health. For example, take the immune system; it is generally believed that stomach ulcers are caused by infections and that the type of bacteria responsible for this is helicobacters but, this bacteria is a natural resident of the gut and therefore is only able to take advantage of its position in the stomach when there is a dehydrated state. In other words when there is sufficient water in the body this bacteria is unable to compromise the health of the organism. 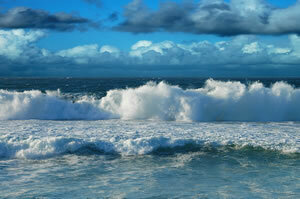 Hopefully by now, with these few examples, the role and magnitude of water in our lives is becoming ever clearer. The list of health benefits and implications of water in our lives could not be properly documented here. This handout serves only as a catalyst hoping to propel the reader towards taking the responsibility for their water consumption more seriously. Isn’t it tragic that the developed world has more than enough water and yet doesn’t imbibe what it needs and the so- called third world has a far greater appreciation of water and yet rarely can their needs be met? The biggest threat to our well-being is stress. Stress comes in many forms. There is environmental stress, stress and strain of modern living, the extraordinary stress of fatigue. In fact if we take a thorough look at our lives we will find that there are many ways in which we are taxed and stretched beyond our capacity. The problem with being stretched in this way is the body responds with what can best be described as dehydration alert. Stress places a massive burden on the brain and vital organs which depend so much on water for healthy functioning. The stress literally causes evaporation of the water in the cells as we place greater and greater demands on the mind and body. If the water is not adequately replaced, which in most instances it is not, then the terror of dehydration kicks in. What happens at this point is that the body produces cholesterol in an attempt to hold onto the water left within the cells. The body’s own genetic wisdom recognises that dehydration threatens its very existence and so finds a way to protect itself, by producing cholesterol. If this production of cholesterol was a short term response, as nature intended, then the body would successfully manoeuvre its way through the threat of dehydration. Sadly, this is not a temporary state at all because most of us are continuously entangled within the web of stress. We are taxed by poor nutrition, various forms of pollution, inadequate amounts of water, working regimes, challenging relationships etc., all of which keep the body in a highly stressed state. As a result we continue producing cholesterol which is a huge problem; not only does it seal the fluid inside the cell causing stagnation, but it also prevents the cell from imbibing vital nutrients. The natural flow of electrolytes taken in during daylight hours and replaced during night time hours becomes severely handicapped, leading to a host of metabolic by-products which are never properly discharged. The secret to health is the excretion of waste. If waste products are not appropriately discharged from the organism then they are re-imbibed. This is a process known as endotoxicity, a condition where we continually recycle and reabsorb our own waste. Excessive stress causes the various blockages triggering the over-production of cholesterol and so endotoxicity is born. Once this negative cycle is set up we have all the conditions for ill health in place. The stagnation of endotoxicity is our greatest enemy. Freedom and movement are our dearest friends. In order for the effective removal of waste there needs to be freedom and movement. Freedom and movement lead to divine health and well-being, spiritually, mentally and physically. We need to prevent endotoxicity at all levels. Wherever there is waste in our lives that is not appropriately being discharged we inadvertently re-imbibe that waste. That waste in turn creates blockages preventing freedom and movement therefore preventing spiritual, mental and physical health (see: waste weakens). Why does it challenge our present scientific understanding to think of water as being pivotal in our lives? Were we to simply draw on common sense it wouldn’t challenge us at all. We are vertical rivers. We are at least 65-75% water. Everything in the body depends on water to work optimally. The health of the body depends on the health of the cell and as we can see, when dehydration alert is taking place the health of the cell is compromised. So it should come as no surprise to us that one of the pivotal ingredients to addressing this situation is to imbibe sufficient quantities of water to give the body a fighting chance of restoring health. Once again we are able to see the wonder of water, without it there cannot be freedom and movement, without freedom and movement of the vital fluids in the body health cannot be sustained. As a result the body will stagnate and die in its own waste. Remember all disease begins with the inadequate removal of waste and as a vertical river, the primary nutrient you need for mental, physical and spiritual health is indeed water. Go and get a glass right now and make this the beginning of a long, intimate relationship. 1. Histamine is a neurotransmitter (a nerve cell which transmits electrical and chemical messages within the body) and it plays a part in the way that water is used and distributed around the body. In addition, it regulates bronchial muscle contraction. An asthmatic response is an indication that the body has resorted to an increase in the production of histamine as a consequence of dehydration. This is because every time we breath out, we lose water in the form of vapour and in an attempt to regulate and preserve water, histamine induces the constriction of the bronchial muscles, hence the familiar asthmatic response of struggling for breath. 2. Histamine is also heavily involved with immunity – antibacterial, anti-viral and anti-foreign body activity. In the state of dehydration, histamine activity is exaggerated (as indicated in point 1). This explains the over-zealous allergic response to foreign bodies such as pollen, which results in the range of symptoms commonly referred to as hay fever. 3. High blood pressure is one of the consequences of an ‘adaptive process’ undertaken by the body in response to dehydration. Blood volume decreases as water in the body decreases and in response the body closes down some capillary beds in order to keep other blood vessels full. Resistance to blood flow results and only an increase in pressure behind the circulating blood will ensure the passage of fluids through the system. This increased pressure is referred to as hypertension. Where there is not free-flowing movement of essential fluids in the body, increased tension will result. 4. Where there is dehydration the body holds onto sodium (salt) in an effort to retain water. The very delicate balance between water inside a cell and water held around the cell is regulated by salt. Hypertension or high blood pressure is often treated with diuretics (medication which makes the body expel water) to reduce salt levels as it is widely accepted that salt is a causal factor in high blood pressure. However it is water which is needed to restore the balance. 5. The causes of depression are multi-factorial and can be identified on physical, psychological and spiritual levels. Successful treatment likewise needs to address all levels. On the physiological level, as the brain is about 85% water, it follows that where there is dehydration brain function will be compromised. One aspect of this is that the brain uses electrical energy to conduct chemical messages from one site to the next and this is facilitated by the presence of water. 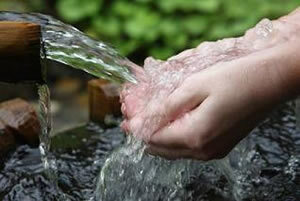 6.Water facilitates the uptake of nutrients. Orthomolecular medicine shows us that depletion in specific nutrients contributes to a range of mental health difficulties. Dehydration directly inhibits adequate absorption of vital nutrients in the brain and therefore impacts on our emotional and psychological health. 7. The digestive system is critical to health. If this system is unable to function properly then every other system is undermined because all macro and micro nutrients dealt with by our digestive processes are responsible for cell/tissue generation and repair, hormone production, metabolism maintenance etc. When a glass of water is drunk it is immediately absorbed. Approximately half an hour later the same amount of water is secreted back into the stomach lining to create a buffer from acid which the stomach secretes in preparation for food. Without sufficient water, this protective mechanism cannot work effectively and so painful damage to the stomach lining can result. ← Previous Previous post: Drinking Enough Water….